The Kensington House is a home for a family of four. The residence provides a sensitively controlled private realm for its occupants, through varying degrees of transparency in each direction. The street-facing east façade is finely screened in timber; whilst the two sides towards neighbours have high level glazing and are otherwise blank save for a slither of window illuminating various service spaces. The west façade provides expansive views, mediating sunlight with operable louvres, large overhangs and vertical concrete blinkers. The front elevation offers a clear treatise on the necessary elements of entry to a home: fence, path, wall, door, and overhang. The simplicity of these components draws the visitor into a crystalline, uncomplicated experience of entry; towards a timber door under a steel awning of simple proportions. 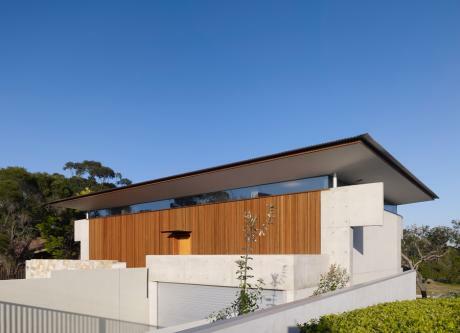 At close proximity the fine grain of the screens and the craftsmanship of the construction become evident, and on crossing the threshold, the house welcomes the guest into secluded surroundings bathed in reflected light. The palette and composition of high quality, robust materials ensure that the structure will enrich with the passing of time and as the family resides.